After a week of profiling contemporary black-and-white TCMA sets, Cramer's full-color alternatives sure jump off the card at you. Even its stamp-sized Pepsi logo looks cheery. Do those dark brows and long nose seem familiar? I, for one, look forward to Zach Braff playing lead in The Howie Mitchell Story or perhaps Howie playing lead in The Zach Braff Story. 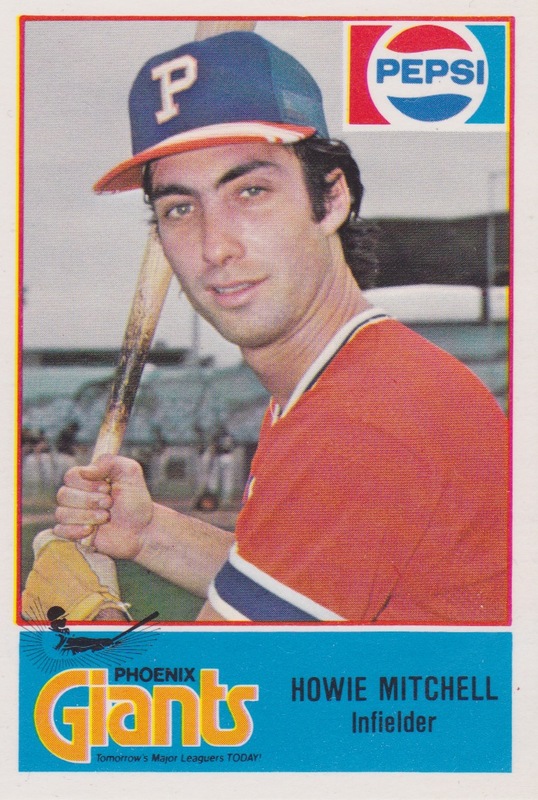 Howie's generation of the Phoenix Giants changed names to the Firebirds in 1986 and remained in town until 1997, when the Arizona Diamondbacks debut effectively killed their minor league team. Unfortunately, 1978 served as both Howie's first season at Triple-A and only season at Triple-A. 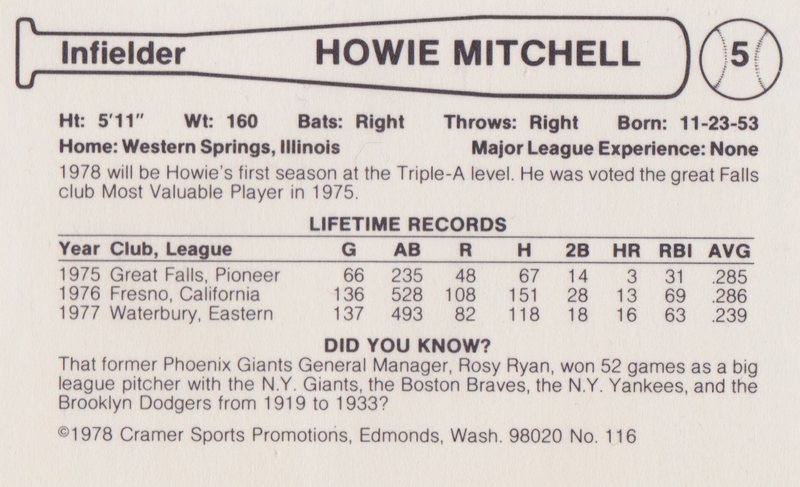 Mitchell never cracked the majors and his career ended after 1979, probably for lack of power (career stats). Many middle infielders had slugging % below their OPB, but the MLB Giants got at least average production from Johnnie LeMaster, Tim Foli, and Bill Madlock at 2B and SS in the late 70s. 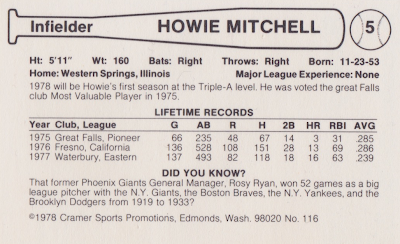 Value: Howie cost $3 on eBay a few years ago. His bolded teammates made the majors, so could cost more. Mr. Mitchell is one of the reasons why Johnnie LeMaster lasted so long in the bigs. The Giants just didn't have many good-hitting infielders in their system. Good point and it reminds me why Cal Ripken seemed like such a revelation. Getting great production from low-power positions often does wonders for a team.